Ever had one of those nights...you know the ones I am talking about. You are feeling tired at about 8:00 PM, but either you have too much to do so you keep on going, or you refuse to allow yourself to actually go to bed at 8:00 (Who does THAT? For crying out loud, sleep is for the very young or the very old, right?!). Anyway, whatever the reason, you stay awake, and then when 10:00 PM rolls around, you CAN'T SLEEP! So, that's where I am right now. It's 10:30 PM in my house. All creatures, er, I mean children and husband, are sound asleep. I can even hear the snores of my oldest son vibrating through the floor. I was dead tired at around 8:30, but I am a mom, and moms aren't allowed to go to bed before their kids. So, I fought my body's urge to crash and burn and stayed awake. Bad move. Now, I can't sleep. My mind is racing over events of the day, upcoming doctor's appointments, holiday plans, and on and on and on. 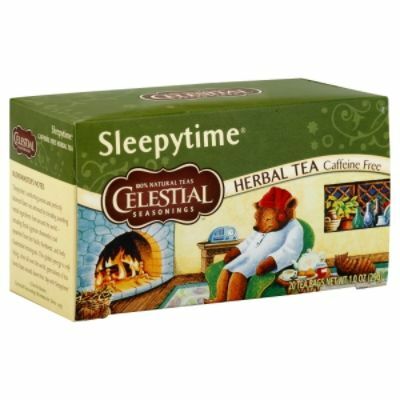 On nights like these, I trust my good friend Celestial Seasonings Sleepytime Herbal Tea to help me out. Ever try this tea? If not, and if you enjoy the flavor of herbal tea, this one is a must-try! A soothing blend of chamomile, spearmint, and lemongrass. Sleepytime is the most beloved of our herbal tea recipes. “Sleepytime's comforting aroma and perfectly balanced flavor are achieved by blending soothing herbal ingredients from around the world – including floral Egyptian chamomile, cool spearmint from the Pacific Northwest, and lively Guatemalan lemongrass. This global synergy is only fitting, since all over the world, generations of tea lovers have wound down their day with Sleepytime." I have been enjoying Sleepytime Herbal Tea for about five years. I was introduced to it by my mother-in-law when we were visiting one weekend, and I was stressed out over one thing or another. She claimed that the tea would relax me, and though skeptical at first, I tried it figuring I had nothing to lose. I was surprised to see for myself that the tea really did work! Ever since that night, I drink a cup of the tea anytime I need my body to relax so that I can rest. In my family, Sleepytime Herbal Tea isn't only a favorite of mine. My husband and 11 year old son love it too! My son is a lot like me and tends to have a difficult time falling asleep some nights. I used to make him a cup of Sleepytime Herbal Tea with honey using the tea bags, but now that we have the Sleepytime Herbal Tea in K-Cups for the Keurig, my son makes his own cup of tea whenever he feels he needs one. If you prefer tea bags, then you have a nice variety of Sleepytime Herbal Teas available to you. 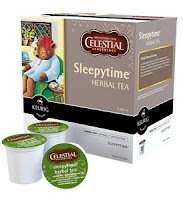 In addition to the original tea, Celestial Seasonings also offers Sleepytime Vanilla, And Sleepytime Decaf Lemon Jasmine Tea. They also offer the following blends which are recommended for adults only: Sleepytime Extra Wellness Tea, Sleepytime Throat Tamer Wellness Tea, and Sleepytime Sinus Soother Wellness Tea. (These teas are also not recommended for people with autoimmune diseases, HIV, collagen diseases, leukocytosis, multiple sclerosis, systemic lupus or tuberculosis. If you are taking prescription medication, or are pregnant or nursing, consult your health care provider prior to using this product. Persons with allergies to the daisy family may be sensitive to echinacea.). Sleepytime Herbal Tea bag products can be purchased in your local grocery store and online in Celestial Seasonings e-store. Sleepytime K-Cup Herbal Tea for the Keurig machine can be purchased online at Green Mountain Coffee. So, enough typing tonight. I'm signing off so I can sip my Sleepytime Herbal Tea and drift off to sleep. Goodnight. I love Celestial Seasonings Tea. I have tried many of them and like the holiday teas also. I do use this at night and find it very pleasant and relaxing. It is a great tea with fantastic herbs.